Is there an easy way to achieve this? Just add images to the program, choose transition effects, and the animated banner is created? The answer is yes. With Photo Slideshow Maker, the animated Flash banner software, you can make animated Flash banner and intros in a matter of minutes. The animated Flash banner maker is very intuitive, slick-looking, and it's extremely easy to navigate, allowing users to create their first animated Flash banner and intros in a matter of minutes, turning photos into Flash slideshow. In the above showcase, we just add the images (500x130 pixels) into the Photo Slideshow Maker program, apply transition effect, choose the Simple template from dozens of ready-for-use Flash slideshow templates, and then go to export the animated banner. The result is a SWF file and an XML document. You can also create a standalone SWF file to include this animated banner. The last thing you need to do is embedding the animated Flash banner to your website. The animated Flash banner program is compatible with Windows XP, Vista and the latest Windows 7. And before you pay out real money to buy this animated Flash banner creating software, you got a change to try it out. Just download it from our website to use. There is no Mac version of animated Flash banner creator yet. However, if you would like to use the animated Flash banner software on Mac and OS X, you may try Parallels, a third-party utility that can enable you to use Windows programs like animated Flash banner maker and Mac apps side-by-side without rebooting. The new intuitive interface of the animated Flash banner program walks users through the process of creating Flash banners and intros for embeddin to website. The animated Flash banner maker supports JPG, TIFF, BMP and PNG files. It’s recommend that all images are edited before they are added to the animated Flash banner project. For instance, you should crop or resize some images so that every images in the animated Flash banner is with the same size and feel. 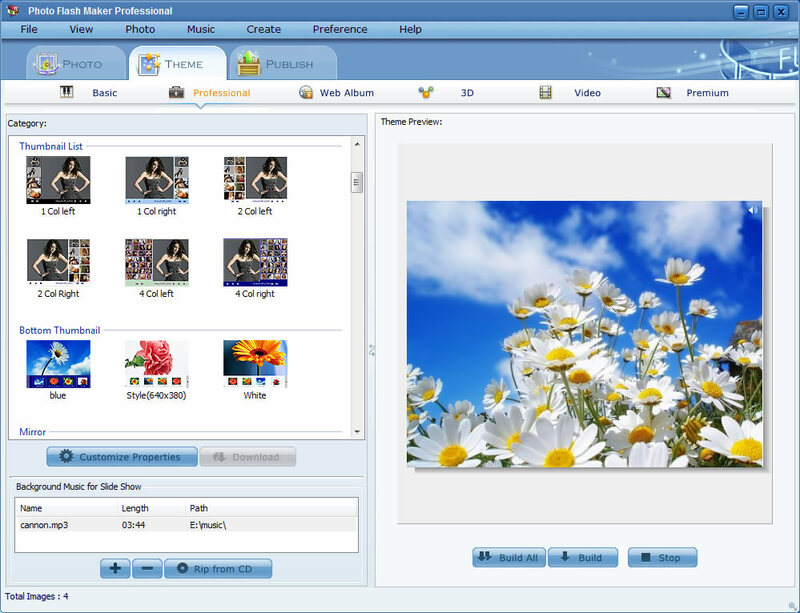 Users can choose from Random, Wipe from Left, Fade to White, Cross Expansion and other 60-plus transition effects. Pan & Zoom effect is also applicable to some Flash templates when you create animated Flash banner or intros. The Basic Flash template is easy-to-use and creates standalone SWF file, while the Advanced Flash template is more dynamic and creates XML-driven Flash. All these Flash templates in the animated Flash banner software are ready-for-use. Just choose one of the templates, do some simple settings, and proceed to publish your animated Flash banner. If you use Basic Flash templates to create animated Flash banner, you get standalone SWF file, which is simple to manage and share; If you use Advanced Flash templates to create animated Flash banner, you get XML-driven Flash, which offers you more dynamic controls.